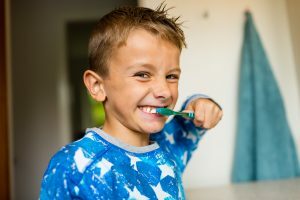 Why Brush And Floss At Bedtime? Life gets busy and sometimes the everyday essentials end up taking the backseat. For example, you and the kids have a long day outdoors in Sheridan, WY, and you all fall asleep in the living room. Before going to bed, it can seem a lot easier to just skip the nighttime routine of washing your face and brushing your teeth. Today we’re going to explore the importance of a brushing and flossing teeth before going to sleep. Skipping it can leave bacteria time in your mouth to cause tooth decay and gum disease. When your body goes to sleep, your conscious activities cease and your body sets to autopilot. One of the things that your body does in sleep mode is limit the production of saliva. It does this to lower your risk of choking while you are asleep. However, your saliva is your body’s natural rinsing agent and defense against bacterial buildup. A dry, sleeping mouth is a perfect home for harmful bacteria to multiply. This buildup of bacteria is why most people wake up with “morning breath.” If you leave food and drink particles in your mouth while you sleep, they can become feasts to the bacteria. When the harmful bacteria in your mouth feasts on leftover food and drink, it can create acid that attacks your teeth. By making sure that your smile is clean before going to sleep, you can help limit the harmful acidic attacks that can occur. Even something as innocuous as cough syrup should be consume prior to your oral hygiene session. Cough syrup is designed to coat your throat which means it will also coat the surfaces of your teeth, gums, and tongue. The last thing to be inside your mouth before you go to sleep should be a toothbrush, floss, mouthwash, or water. A bedtime routine can help keep your smile healthy. To schedule a consultation, call Grinnell Street Dental in Sheridan, WY, at (307) 672-7567. Along with residents of Sheridan, we also proudly serve the residents of Gillette, Billings, Miles City, and all surrounding communities.